The Universal Trammel Tool Set is designed to perform center to center rod-end bearing measurements to within 0.01″ for UH-60, CH-47, AH-64, OH-58, and UH-1 series?pitch control, flight control rods, servos, and linkages requiring specific bearing measurement replacement, as specified in the Maintenance Manuals for trammeling tasks. It can also be expanded to accommodate other helicopter platforms requiring similar maintenance procedures. 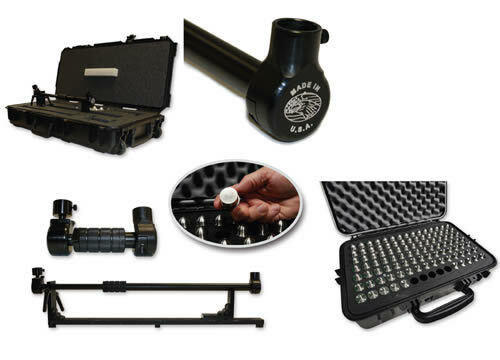 The Universal Trammel Tool Set is self-contained in its own militarized packaging MIL-SPEC container to ensure storage, preservation, and accountability. Each component has a shadow box location in the container for ease of inspection and identification. When the component is placed on the tool, it will accurately measure and record the center to center distance of pitch control, flight control rods, servos, and linkage bearings to the nearest .01″. The tool has component-specific pins that attach to the tool and fit the inside diameter of the bearing at each end. The tool can accommodate the 90 degree offset for M/R flight control rod ends and the pivot angle of M/R pitch control rod elastomeric bearings. A built-in graduated steel rule is?integrated to the tool for measuring reference. Copyright Walin Tools, LLC © 2019. All Rights Reserved.